Chelsea were crowned Premier League champions as Michy Batshuayi’s late goal gave them the victory they required to secure the title at West Brom. It didn’t always look this way as they were frustrated for long periods by the resilience and organisation of their hosts. But Conte made two substitutions and within minutes Chelsea were in the lead. Chelsea’s hero Batshuayi scored his first goal after spending the entire season on the bench. What an introduction it was. Chelsea were eighth, eight points behind leaders Manchester City after that loss at Emirates Stadium. A 13-match winning streak followed, and they are now 10 points clear of their nearest challengers with two games remaining. “It was very frustrating for me because at the end of the Arsenal game I didn’t see anything from my work or my ideas on football,” said Conte. The Blues became champions of England for a sixth time – with two games to spare – thanks to Michy Batshuayi’s late goal in a 1-0 win at West Brom. Only Manchester United have won more in the modern era. Captain Gary Cahill said the players always believed they could mount a title charge despite finishing 10th last season, 31 points adrift of champions Leicester. The losses at home to Liverpool and at Arsenal in September that hinted at early struggles seemed an age away, as did the surprise defeat by struggling Crystal Palace at Stamford Bridge, and the setback at Manchester United. 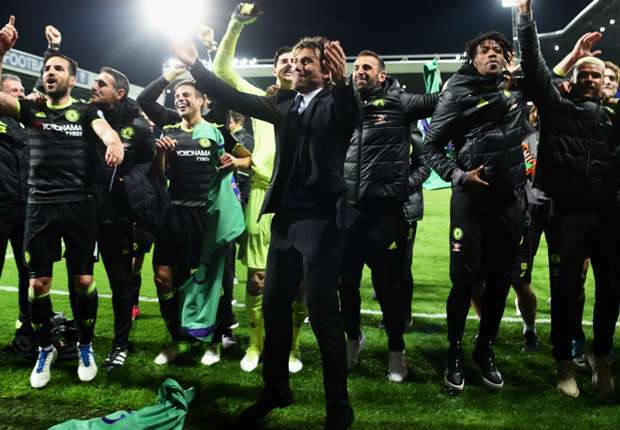 Chelsea, even when not at their best, proved themselves the strongest and most complete side in the Premier League – and they proved it again on a night they were tested.